Young and old dogs can be afraid of the leash, creating neurotic and fearful behavior when it's time for walkies. Here's how to deal with fear of the leash in your dog. A fear of leash walking is by no means limited to Shelties, but since some Shelties can be very nervous dogs, it's easier for phobias to develop. Young and old dogs can have a fear of the leash too. This article explains the best way to deal with fear of the leash and how to get your Sheltie into a healthy walking routine. What Causes a Fear of Leash Walking? Often, the sight of the leash is enough to bring on a fit of joy in a dog. Most dogs know that the leash means a walk - and they react accordingly. For some dogs though, the leash creates fear and submissiveness more than anything else. This can happen when the leash was used in a negative way with a previous owner; as a tool for dragging the dog around. Perhaps it was used to confine the dog for long hours at a time. In some extreme cases, dogs have even been whipped with the leash as punishment. Or perhaps your dog is just very highly strung, and is prone to developing phobias seemingly arbitrarily. Although fear of the leash can have a severely negative impact on your walks with your dog, the good news is that it's easy to cure. You just need some patience and some basic equipment. A leash, made of webbing or leather. About 5 feet (1.25 meters) is a good length, as it enables control without risk of the dog getting tangled up in the leash. Chain-link leashes aren't recommended as they're hard on the hands - and also can flick the dog in the face, which really isn't something you'd want to inflict on your Sheltie. A good quality collar, again made of leather or nylon webbing. If you're using one with a snap-lock, make sure it's safety-approved and won't come undone under pressure. Slip-chain collars (also known as choke chains, chokers or check chains) are a training tool only, and should never be left on an unattended dog. The aim is to accustom your dog to the lead a little bit at a time, keeping him well within his comfort zone every step of the way. 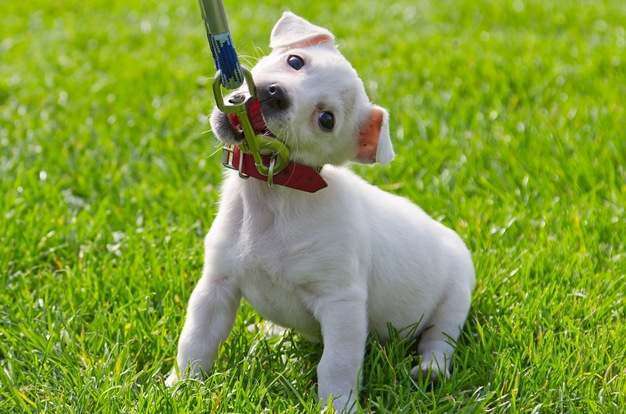 If he's already got a fear of the leash, you can expect him to be a little wary, but watch out for signs of extreme fear: hyperventilating, drooling, submissive urination or rolling eyes. If your Sheltie is really afraid of the leash, you'll need to accustom him to it very slowly indeed. At first, just leave it out in full view, preferably in places with a positive association: next to his food bowl, in preferred play areas, and near his bed. Once he's stopped reacting to the sight of it, introduce the leash to him in a more active manner. You can do this by wrapping it around your hand as you pet and groom him. Hold the leash in your hand as you prepare his food, sit by him and stroke him, with the leash wrapped around your hand. Keep this up until he's stopped showing any signs of discomfort. It may take some time, but remember that you're aiming to accustom him comfortably to the leash. Rushing is counterproductive. When he's not showing any signs of nervousness with this level of progress, you can start attaching the leash to his collar. Put him in a sit-stay position, using a firm, calm voice, and clip the leash on. Don't make a big deal out of it: your dog will take his emotional and psychological cues from your behavior. If you act as though it's not a big deal, he'll follow your lead. Once the leash is on, give him some time to get used to the sensation of something hanging off his neck. He may get a little panicky at this stage, and start pawing at his neck and trying to rub the leash off along the ground. If he's showing signs of nervousness, distract him with a game: tug-of-war, fetch, or if you're in an enclosed space, go for a short walk. Don't attempt to touch the leash at this stage, just let him walk around freely with it attached to his collar. Take the leash off after five minutes or so, and praise him lavishly for being such a good boy. Give him a couple of small, tasty treats, and lots of petting. Repeat these last three steps several more times before progressing to the next level: you want to give him plenty of opportunities to get used to the sensation of the leash itself before you start using it to control his walking. The more positive associations he forms with the leash (which he will do through the games, walks, and treats while wearing it), the better for his progress. Next, it's time for a short obedience training session while he's wearing the leash. Five minutes is plenty: practice a sit-stay and the recall command while he's wearing the leash. This will reinforce your authority and leadership, and remind him that he's still expected to obey you while wearing the leash. When he's readily obeying your commands with the leash on, you can take him for a short walk while he's wearing it. If he's jumpy, do not reinforce his nervousness by rewarding him with attention. Simply ignore him and carry on walking. Remember, he takes his cues from you, so keep calm and wait for it to pass. If your Sheltie is too nervous or panicky after several minutes, return to a level where he was last 100% comfortable. Wait a few days at this stage before taking him for another short leash walk. Be patient. Don't rush your dog's progress: using force is counterproductive to your end goal. You're teaching him to relax and be calm around the leash - if you get frustrated with his lack of progress, he'll sense it and his anxiety will increase. Don't indulge his nervousness or coddle him. If you react to his crying with petting and cooing, you are telling him that it's OK to feel like that. If he's nervous, either ignore it and carry on, or distract him with a game. Never correct or punish him for skittishness or nervous behavior. It's counterproductive in the extreme. This article is based on research from Secrets to Dog Training by Daniel Stevens.